Only 31 percent of U.S. adults report that they engage in regular leisure-time physical activity (defined as either three sessions per week of vigorous physical activity lasting 20 minutes or more, or five sessions per week of light-to-moderate physical activity lasting 30 minutes or more). 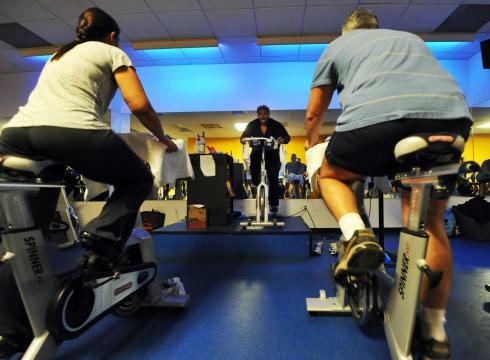 About 40 percent of adults report no leisure-time physical activity. About 35 percent of high school students report that they participate in at least 60 minutes of physical activity on 5 or more days of the week, and only 30 percent of students report that they attend physical education class daily. As children get older, participation in regular physical activity decreases dramatically. In contrast to reported activity, when physical activity is measured by a device that detects movement, only about 3–5 percent of adults obtain 30 minutes of moderate or greater intensity physical activity on at least 5 days per week. Among youth, measured activity provides information on younger children than is available with reports and highlights the decline in activity from childhood to adolescence. For example, 42 percent of children age 6–11 obtain the recommended 60 minutes per day of physical activity, whereas only 8 percent of adolescents achieve this goal. 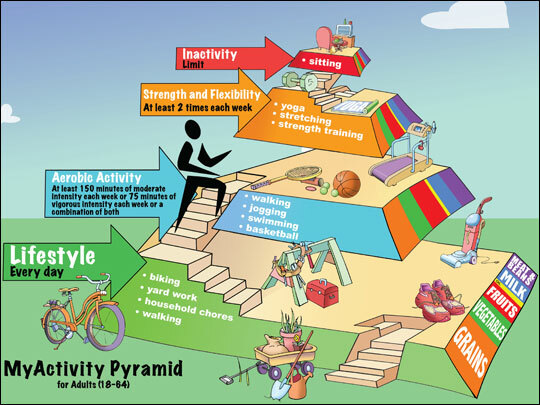 What are the benefits of physical activity? Research suggests that physical activity may reduce the risk of many adverse health conditions, such as coronary heart disease, stroke, some cancers, type 2 diabetes, osteoporosis, and depression. In addition, physical activity can help reduce risk factors for conditions such as high blood pressure and blood cholesterol. Researchers believe that some physical activity is better than none, and additional health benefits can be gained by increasing the frequency, intensity, and duration of physical activity. Active at Any Size Day 10: What can I do? ◆If possible, take 2- to 3-minute walking breaks at work a few times a day. ◆Put away the TV remote control— get up to change the channel. ◆March in place during TV commercials. ◆Stand or walk, rather than sit, while talking on the phone. Even a shopping trip can be exercise, since it is a chance to walk and carry your bags. In addition, doing chores like lawn mowing, raking leaves, gardening, and housework can count as activity. If you can do only a few or none of these activities, it is OK. Appreciate what you can do, even if you think it is a small amount. Doing any movement—even for a short time—can make you healthier. 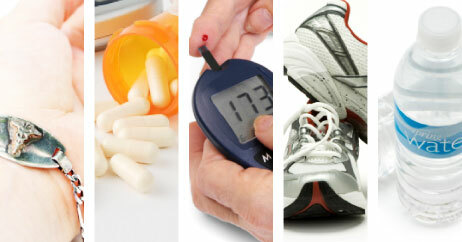 Remember, each activity you do is a step toward a more active lifestyle. Active at Any Size Day 6: What can I do? ◆Helps flexibility. You can bend and move your body in water in ways you cannot on land. ◆Reduces risk of injury. Water makes your body float. This keeps your joints from being pounded or jarred and helps prevent sore muscles and injury. ◆Keeps you refreshed. You can keep cool in water—even when you are working hard. You do not need to know how to swim to work out in water—you can do shallow-water or deep-water exercises without swimming. For shallow-water workouts, the water level should be between your waist and your chest. If the water is too shallow, it will be hard to move your arms underwater. If the water is deeper than chest-height, it will be hard to keep your feet on the pool bottom. For deep-water workouts, most of your body is underwater. 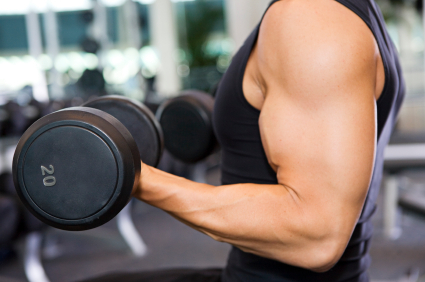 This means that your whole body will get a good workout. For safety and comfort, wear a foam belt or life jacket. 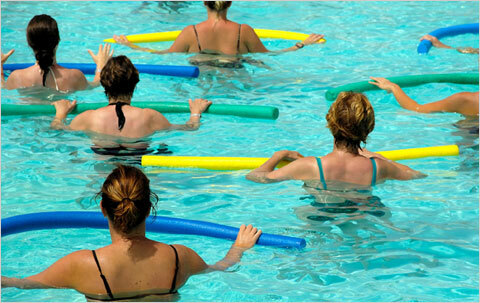 Many swim centers offer classes in water workouts. Check with the pools in your area to find the best water workout for you. You can do many activities in your home. But there are other fun places to be active, including health clubs, recreation centers, or outdoors. It may be hard to be physically active around other people. Keep in mind that you have just as much right to be healthy and active as anyone else. Active at Any Size Day 5: What can I do? ◆Make your lungs work better. Dancing on your feet is a weight-bearing activity. Dancing while seated is a nonweight-bearing activity. Sometimes called chair dancing, this activity lets you move your arms and legs to music while taking the weight off your feet. This may be a good choice if you cannot stand on your feet for a long time.